In a recent coment I wrote, “AGILE PROJECT MANAGEMENT has been a topic at the [PMI] conference. Indeed, I believe there were 2-3 presentations on this very topic. For example, Michele Sliger, co-author of the newly published and excellent book “The Software Project Manager’s Bridge to Agility (Agile Software Development Series)”, talked about Agile Project Management. I want to go a step further and state that agile project management is the natural way of effective project management. There are very good reasons for this hypthesis to be true. Textbooks suggest that project life cycles are linear. This means that a project evolves along a pre-defined path: initation – planning – executing – monitor & control – closeout. This, for example, is what the PMBOK suggests. Unfortunately, reality is more complex. Indeed I have not seen a single project which has strictly followed this sequence. Instead, a project goes from one phase to another and may jump back or forth. 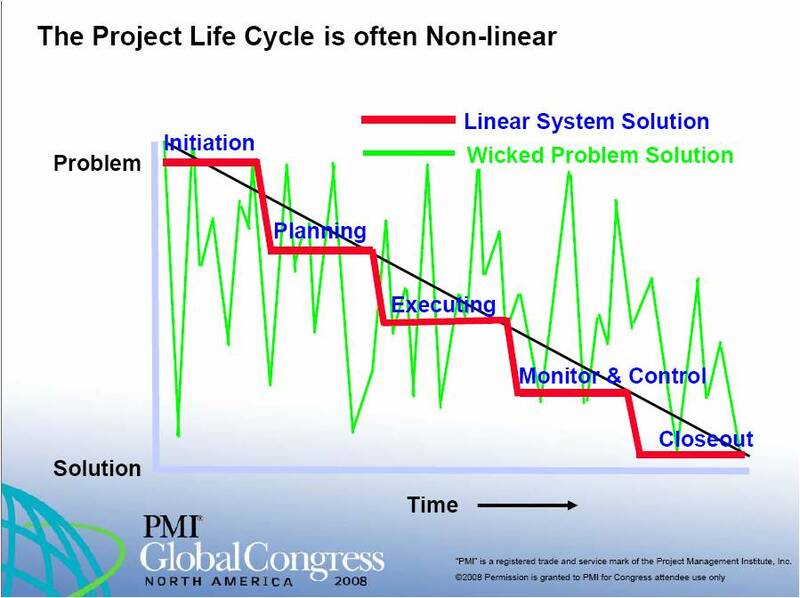 Tom Johns of Business Management Consultants illustrated this in his presentation “The Art of Project Management (c) Complexity” at the PMI Global Congress 2008 in Denver. I believe that every effective project manager has to be familiar with agile project management to survive, to cope with unexpected changes without losing control. Regarding the various approaches of agile, let it be Scrum, XP, RUP, etc., it doesn’t matter. As a matter of fact my experience shows that a hyprid approach may work best. It has to be customized to the respective project environment and organization. Strictly following a doctrine without looking left or right is narrow minded and one-dimensional. It neglects the reality of complexity we are living in. If doing so, you may be better off or at as well of following a traditional, linear waterfall approach thinking this may be good, structured project management. Nothing could be further from the truth. Any model, may it be a waterfall or agile approach, serves as a guideline. The art of project management is to identify and use simple rules which help constitute guidelines for effective and efficient project work which yield tangible results which are in sync with the vision and objectives of the project and the project organization. In a previous post I was contemplating about whether DELIVERY becomes a part of my definition of effective leadership. It does as it has to. For, how can you be an effective leader without delivering results?! You can’t. At the end of the day you have to deliver. Hence, delivering results is both a prerequisite and an outcome of effective leadership. The effective leader ensures delivery while incorporating the first 3 key characteristics of leadership: defining vision, nurturing collaboration, promoting learning. All four rules are important and critical for an effective leader to follow. However, if I have to choose the most important element in effective leadership it is the first one: Defining vision. Without this element, no person can acclaim to be an effective leader. A vision gives a direction, though not necessarily directives. It paves the way to success, to delivery. Alas, an effective leader is nothing without a functioning team. This is why nurturing collaboration is so important. Team building is both an art and a necessity without which no project leader can succeed. Last but not least, we live in a complex and ever changing world. We need to reflect our actions, learn from our mistakes and move to the next level. An effective leader ensures and helps build an honest, sincere and productive learning environment. This is an environment where it is ok to make mistakes – as long as we learn from them (“Never make a mistake more than twice, though.”). Making mistakes must not be punished or used against the person who committed it. If we are on a project the complete team should learn from individual and team mistakes. This is what it can make the stream strong, help yield synergy effects. What about constellations which are not “projects”? The same rules apply to any organization there is. And why should it be any different!? An organization without a vision, without set goals, direction dies. It loses the legitimacy to exist and will cease, sooner or later. Entropy at its best, so to say. For an organization to prosper and mature it needs to guarantee effective collaboration. Learning is equally important. Stagnation in today’s business world and economy leads to loss and failure. Those companies which manage to re-invent themselves, develop new ideas, nuture and embrace innovation will survice and succeed. That is, if and only if, they also manage to deliver the right results which bring us back to the first element of effective leadership: vision. The results have to be in sync, have to be in line with the vision. If this is not the case the organization is inherently incoherent and lacks direction. This brings me to the conclusion that if we illustrated the first 3 elements of effective leadership as a triangle with Vision at the top, Collaboration in the middle and learning at the buttom, the fourth element of delivery would be the circle around this triangle which makes it whole. This is true, coherent and whole effective leadership. Wow, what a conference! I cannot remember any conference or professional meeting I ever attended where there was such a wealth of knowledge, interesting people, inspiring ideas. It will take a time to digest all the information. All I can say is that I highly recommend this conference to anyone seriously interested in project management – and leadership. The sessions I attended dealt with project leadership (vs. simple project management), complexity of projects, PMOs, communication to and for executives. In a nutshell? The insights about how to set up and manage PMOs were not new but re-assuring. Project leadership becomes ever more important in a complex world. Effective project leaders manage executives to act for the success of a project. Now, there is much more to it. Of course, there is. And I will write more about it in the days and weeks to come. So stay tuned. Yesterday I met Robert Urwiler, CIO of Vail Resorts. We also talked about my definition of effective leadership. Robert pointed out that he would add a fourth dimension: DELIVERY. This is true and has been a missing piece. Thank you, Robert, for pointing this out! Whether it is a fourth pillar or a foundation of the first three pillars, mmh … let me know what you think! What does this imply for effective leadership? The 3 principles (build vision, nurture collaboration, promote learning) still hold true. With respect to the first element, building vision, an effective leader is skilled to build this “good enough” vision. Note though that defining “simple” rules can be much harder than setting up a complex system of rules and regulations. A good vision provides guidance, it is as strong as it is simple, i.e., simple to understand and simple to follow. Thanks to Tom Johns, PhD, PE, PMP, MAPM, the founder and chairman of Business Management Consultants (www.bmc-online.com) for pointing out these valuable insights of complexity theory. I am looking forward to attend his session “The Art of Project Management Complexity” at the upcoming PMI Global Congress in Denver. Just a few more days till the PMI Global Congress 2008 in Denver. Final preparations are ongoing. By now all white papers and presentations at the Congress have been made available by PMI to all Congress attendants. This facilitates preparation a great deal. Have a look at the sessions I plan to attend in Denver. I posted them a few days earlier, check out the category “PMI Congress Denver 10’08”. In addition to the Congress I plan to host a get-together for a few presenters where we can reflect the keynote speech by Colin Powell and talk about our understandings of effective leadership. Stay tuned. I will let you know how the sessions were in upcoming posts after the conference.